Lily Eskelsen García made history this year when she became the first Latina elected to head the National Education Association, an organization comprised of three million teacher members across the country, including Illinois, and the first female president of NEA since 1983. Eskelsen García paid a visit to Chicago on Monday, Sept. 22nd and Tuesday, Sept. 23rd to the Women and Children First Bookstore for a special reading and signing of her bilingual book, Rabble Rousers: Fearless Fighters for Social Justice/Agitadores: Luchadores Valientes por la Justicia as well as visited the students of Irving Elementary School and Percy Julian Middle School to talk about the importance of standing true to beliefs and the importance of education. Eskelsen García’s path to higher education proved quite interesting. Her journey in education began 20 years ago as a lunch lady before becoming an elementary teacher working with homeless children. As an advocate for promoting quality public education for every student, Eskelsen García has served as critic of high stakes testing and other policies that affect the education system. “We must measure what matters and put students’ needs at the center of the system once again. We can no longer allow politicians who have never stepped into a classroom define what it means to teach and learn,” said Eskelsen García. Nothing pumps up Eskelsen García more than championing quality education. After teaching only nine years, Eskelsen García was named her state’s top teacher. The daughter of an immigrant, she is one of the nation’s top Latino educators and used her position to speak up on behalf of DREAMers seeking a path to U.S. citizenship. Her tenacity and vigor helped put Eskelsen García on the path to NEA where she was elected as executive committee member in 1996 and secretary-treasurer in 2002. In 2008, Eskelsen García was elected NEA vice president, and has continued to promote the teaching profession and quality education. 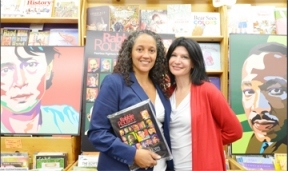 In her latest venture, Eskelsen García’s new book Rabble Rousers/Agitadores spotlights social justice advocates including Mother Jones, Mohandas Gandhi, Nelson Mandela, Cesar Chavez, Martin Luther King, Jr., Harvey Milk, Frieda Zames, Aung San Suu Kyi, and Rigoberta Menchú. “It is vital that we look upon our history and the work of our advocates to become inspired and courageous to make necessary changes in our lives,” said Eskelsen García.